The stories were written too simply for me. Although some I did actually enjoy, others were very strange and morbid. I recommend this book to you if you like folktales or are looking for a quick, rather weird read. A nice little collection of African folk stories that were odd but I quite liked. Some were a bit morbid but they were all interesting. I had a bewildering experience searching Goodreads for this entry, not only because Alexander McCall Smith has written so many books (and not a hint of a plot in any of them! It's weird how I love some of his stuff and hate some, given that it's all essentially identical), but because there are even study guides out there for some of his works. God, people shouldn't be studying The No 1 Ladies' Detective Agency. Didn't Shakespeare write a ton of plays?Anyway, I don't know if I can really count this slight volume of short stories toward my 2013 goal of reading 100 books. I read it over the course of a single morning commute, and I quite enjoyed it, but it was a qualified enjoyment. The stories are hit and miss, and I think that they definitely lose something in the transition from oral to written. Quite often, I would finish a story with a sense of, "Oh. That's it?" I know from my childhood that African folktales, told well and told orally, come vividly to life, and I missed that in this collection.Still, I like McCall Smith's fondness for Africa. I like that I can feel it in his writing. These stories are all from Botswana and Zimbabwe, and they make a good, varied collection. I just don't think reading is the best way to discover them. interesting collection of stories.. some lil dark.. Most of these really are different from the fairy tales that I am familiar with from European cultures. This made them really quite intriguing, and the endings wonderfully unexpected. I liked the voice which really did quite a good job of suggesting the oral tradition of telling these stories. (But wouldn't I love to hear them told in person in a village in Africa. Awesome. )'Chicken, Hawk and the Missing Needle' was a delightfully neat explanation of the mannerisms of a chicken. I won't give it away. It's too lovely to spoil. Just one of them reminded me of a European fairy tale. I wonder if they are related and if so, how. It was called 'How a Strange Creature Took the Place of a Girl and Then Fell into a Hole'. It seemed to be very similar to a story that Phillip Pullman re-told in 'Grimm Tales for Young and Old' called 'The Goose Girl'. Both tales are about a girl who sets off richly dressed and riding a good mount (a buffalo and a horse respectively), on a journey to meet her bridegroom. On the way, she is tricked into exchanging places (clothes and mount) with a wicked person/creature who takes her place as the bride upon arrival. An engaging read. i liked this book because it was just so authentic that until half way through the book i thought that Alexander McCall Smith had just recorded them not written them. this was a fascinating read that drew me in throughly and totally.my favorite short story was the baboons that went this way and that witch ironicly is also the name of the book in witch is is the story of how baboons came to be.the best bit was the reason why baboons live in small groups. it is because when ever they see another baboon that is not family they fall about laughing while the other baboon is jumping up and down in rage so they get angrier and angrier.an over all great read and a high recommendation. Since I am on the AMS marathon read, I had to read this book too! These are folk tales set in Africa specifically from Zimbabwe and Botswana. It's similar to folk tales across the world. A natural justice system punishes wrong doers and weird and wonderful problems are solved in unique and fun ways. I liked it for the cultural milieu it evokes. I could not help but think how wonderful each of these would be as a picture book. Read only if you like Africa, folk tales or AMS or some combination of these. I am not familiar with the traditional folk stories of Africa, but I found it interesting how similar they were to the European tales I grew up with - talking animals, magic and morality.The illustrations were very disappointing though - for such an esteemed author to share these traditional stories, he could easily have engaged a talented artist to illustrate them. A man with a tree growing out of his head? A woman with children made of wax? A bird that can be milked? 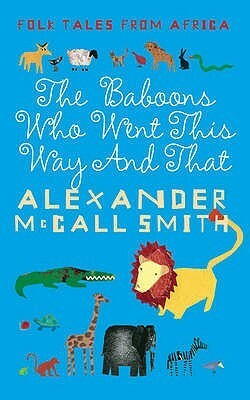 With more stories from his original celebration of African folktales, "The Girl Who Married A Lion", let Alexander McCall Smith once again take you to a land where the bizarre is everyday and magic is real. Beautiful shirt stories, colourful, that leave a warmth in your heart. The illustrations are also simple and pretty, making the book very easy to read, and I just wished I had children to share it with. This is the illustrated version of The Girl Who Married a Lion: and Other Tales from Africa. A somewhat bizarre collection of short stories that will leave you feeling both warm or bewildered! Charming to say the least. A traditional African stories that i think Smith put it as it was told. A good read but not essential. Only for completist. What a prolific writer this guy is! Downloaded this book to read to my 2 kids on holiday, we all loved the folk tales. The illustrations are really cute, would be a beautiful book to own in hardback. Cute, traditional African stories. A very quick read. Not as interesting as his Scotland St. or No. 1 Ladies' Detective Agency series. An easy reading. Suits for children. Easy read - first of his books I have read and I am not sure what I was expecting - I found it odd.